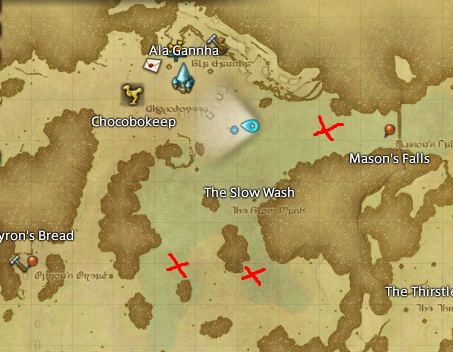 After unlocking Blue Mage, Job Quests for BLU are at levels 1, 10, 20, 30, 40, 50 & 50. *Note that these Job Quests are separate from gaining spell totems, which unlock a few new spells. These spell totems are gained after learning 5, 10, 10, & 20 other spells. *Note that weapons are purely cosmetic for BLUs, the stats from the rest of their gear is weighted more heavily to compensate. Important! You cannot learn spells while dead! So if you have friends helping you with harder spells, make sure they raise you before killing the monster! If a monster uses the spell, then all the BLUs die, get rezzed, and it wasn’t a full wipe (lv70s helping during Primals for example), the BLUs can still learn the spell without having to see the spell used after they were rezzed. Just make sure everyone is alive! To learn Blue Magic, all spells (with the exceptions of those listed under “Special Means”) are learned by defeating a mob after it has used the spell you’re looking for. You do NOT have to be hit by the spell to learn it. You may also learn the spell while in a party. If with other BLUs, every BLU will learn the spell at the same time if the party succeeds as a whole in their chance to learn. The number of BLUs in your party does NOT increase your chance to learn a spell. It is not 1 roll per BLU per kill to learn, but a flat 1 roll per kill. When defeating the monster who’s used the appropriate move, there is a % chance to learn the spell and that seems to be determined by the spell’s rank (exceptions being “Special Means” spells). ★☆☆☆☆ represents the easiest, highest % chance to learn and ★★★★★ being the hardest, lowest % chance to learn. Note that all of the dungeon/raid/trial/Masked Carnivale spells have level requirements. All of the open world & totem spells are available at level 1. You must be able to enter the dungeon/trial, so you must be the minimum level for that dungeon/trial. For many cases, spells must be learned from the mobs in the locations in this list, despite others appearing in the same family in other locations. Not every mob in a monster family uses the spell you’re hunting. Certain monster families use BLU magic regardless of the clue location, so simply seek out the lowest level/easiest one to farm. For example; it seems all Qiqirn can teach Faze. An exception has been found with Chiggoes teaching Blood Drain instead of Bats. This is also true for Leviathan teaching Aqua Breath instead of Ultros. There may be other instances where, if a move of the same name is used, may be learned from monsters outside of their normal family. Garuda’s & Shiva’s Primal spells can only be obtained from Extreme Mode difficulty, while Ramuh’s, Titan’s, Leviathan’s, & Ifrit’s can also be obtained from Hard Mode difficulty. There is currently a bug preventing Ifrit from also teaching Eruption in Normal Mode, that will be corrected in the next hotfix. The difficulty of the Primal (HM vs EX) does not change the learn rate. The learn rate is just incredibly low for 5 star spells. Do whichever version of the Primal you can kill the fastest (except for Garuda and Shiva, where you have to do EX). Also, it is important to note that you can learn spells from monsters higher than you, but you must be able to get to them (dungeons & trials must be unlocked, but you can be carried). There are reports of Fire Angon being reflected off of Ranged & Physical Barriers, despite being listed as a Magical spell. Currently Ifrit is bugged and you cannot learn Eruption from The Bowl of Embers (Normal), this will be addressed in the BLU hotfix soon. Below is a list of all of the spells, sorted by level/ilvl, as well as some alternative locations.